Current: WITCHBLADE ENDS YEAR WITH 150th ISSUE! WITCHBLADE ENDS YEAR WITH 150th ISSUE! Berkeley, CA â€“ 12 December 2011 â€“ Image Comics and Top Cow Productions are proudly spotlighting the landmark 150th issue of their iconic original comic book series this week with an over-sized issue full of extras. WITCHBLADE #150 also marks Ron Marz’s 70th consecutively written issue of one of the longest running comics with a single female lead, and a major turning point in the life of Sara Pezzini. In addition to providing a story that serves as a fitting conclusion to Marz and artist Stjepan Sejic’s critically acclaimed run, WITCHBLADE #150 will also serve as a retrospective of their contributions and the longevity of the series overall. As a special bonus, the issue also includes preview material for WITCHBLADE #151, when the new creative team of Tim Seeley (HACK/SLASH) and Diego Bernard (The Man With No Name) take the reins of Top Cow’s flagship title. 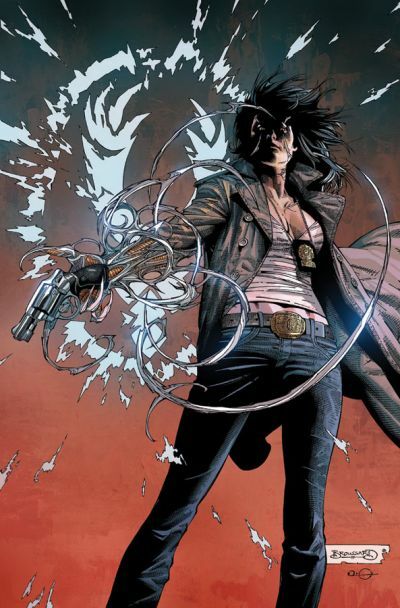 New York City Police Detective Sara Pezzini is the bearer of the Witchblade, a mysterious Artifact that takes the form of a deadly and powerful gauntlet. Sara must try to control the Witchblade and learn its secrets, even as she investigates the city’s strangest, most supernatural crimes. Pezzini has carefully balanced her responsibilities as a police officer with her duties as bearer of the Witchblade for years, but now Lieutenant Phipps, from the Internal Affairs department, threatens to take one of these away from her. In this emotionally charged issue, Sara will be forced to make a decision that will impact the direction of WITCHBLADE for a long time to come. WITCHBLADE #150, a 48-page full-color super hero comic book, will be available in stores and digital platforms on December 14th. This landmark issue will ship with four covers by Stjepan Sejic (JUL110410), Michael Broussard (JUL110411), Mike Choi (JUL110412), and a remastered cover by Michael Turner (JUL110413). WITCHBLADE #151 (AUG110425) will be available in stores and digital platforms on January 4th. For more information on the WITCHBLADE series, please visit www.topcow.com.